LOOK FOR MORE MOXIE SOON! Mz. Moxie has been too on the go to update this page recently! Back up girlfriend! The life of an intergalactic superstar is far from easy. Trust me baby, She'll update you soon! Really, this year is half over? 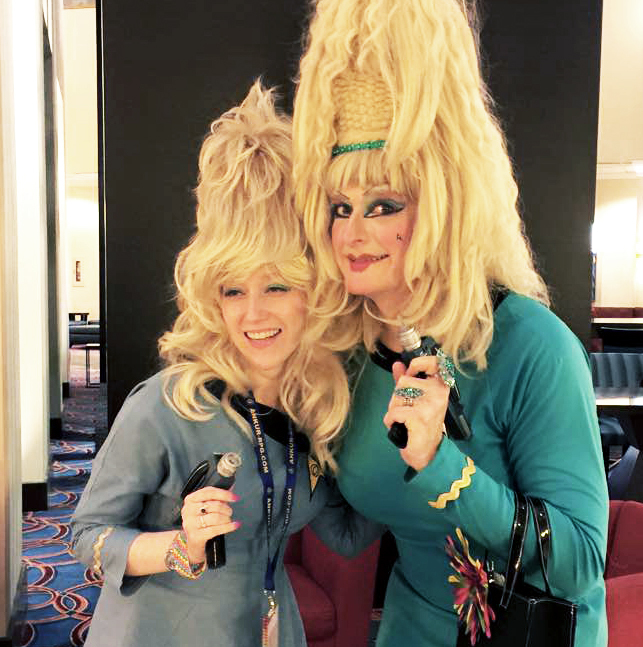 Anyhoo here's what I've been up to: Ohio Concoction, Outlantacon, Timegate. I've been putting all of my energy into growing my hair and listening to Leslie Hall songs and of course working on the webcomic Tales From Salonbay. I'm about to kick it at Dragoncon. See you there? Honey, we're gonna have to sort all of this out later! But in 2014 Mz. 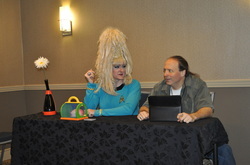 Moxie went to Outlantacon, Timegate, Dragoncon, New York Comiccon, and Starbase Indy! In addition she preformed shows in New York (at the Laurie Beechman Theater) and at several other venues she's probably forgetting! 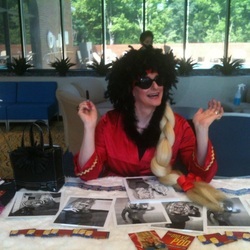 Moxie made it back to Atlantacon in 2014, Where she hosted a live viewing of a Star Trek Episode, performed her crazy show, and acted like a plain old no good fool! It was a hoot and a half! Lt. Magnus was welcomed as an honorary guest aboard the Starship Farragut. She wandered the halls of the ship chatting with the crew and other guests. She narrowly avoided getting stuck in a Jeffries tube. As always, she knew where her towel was not only because she is the reigning Towel Day Ambassador, but because it is the right thing to do! 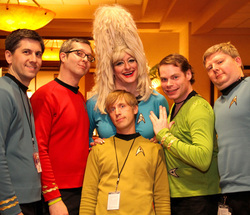 Starbase Indy has to be one of her favorite events and this year she had a blast helping to bring smiles to everyone. She was even featured on their do not disturb door hangers! Moxie joined her good friend Ken Spivey and writer Debbie Viguie in MCing this celebration of Dr. Who's 50th anniversary. Not only did she MC, she also did two 30 minute sets of comedy and song--Yes, song! 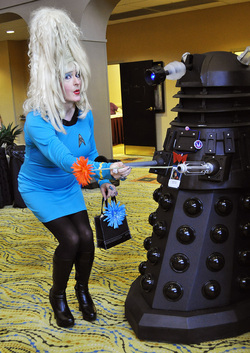 She even destroyed, um, I mean delivered a version of Ken Spivey's own Dalek Dance! 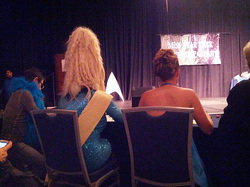 Moxie had the good fortune of being a judge for the Miss Star Trek Universe pageant (seen here sitting between Dominic Keating and Emily Cook, Miss Georgia 2009) but she was most proud of co-hosting one of this years hottest official parties of Dragon*con, The Rainbow Flag Party! 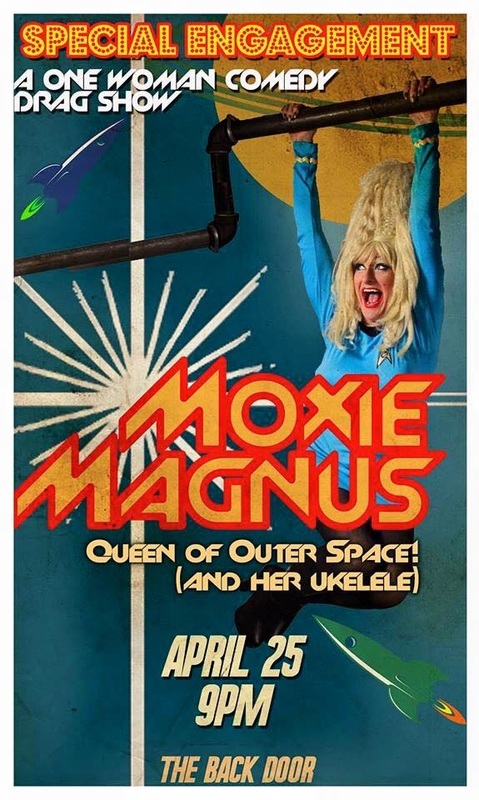 Moxie is one step closer to her dream of performing in all states that begin with an "I". (Idaho is the only one left!) 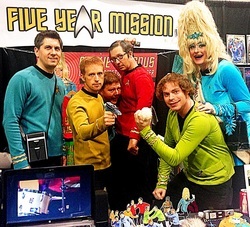 She traveled with her favorite boy band Five Year Mission to the windy city for Chicago Comic Con! Moxie acted as the Mistress of Ceremonies. 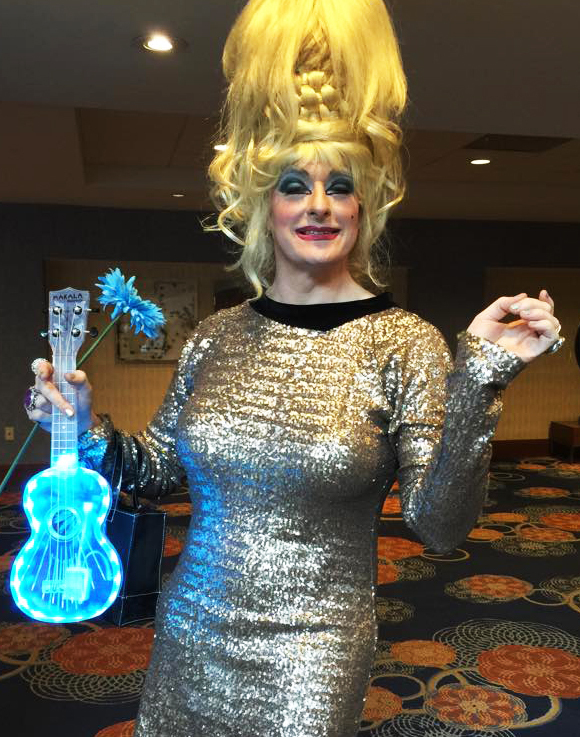 She opened for her dear friends Five Year Mission and even helped them out by giving them an makeover. 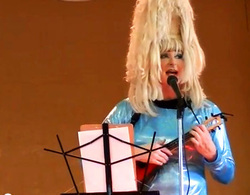 Inconjunction will go down in history as the first place Moxie attempted to play the ukulele in public. Tremors rocked the pacific rim as Queen Liliuokalani spun wildly in her grave. This year Timegate marked the 50th anniversary of Dr. Who by bringing Colin Baker to the con! During the cabaret Moxie made what is arguably one of the slowest quick changes in history into her very own 6th Doctor costume. She had the crowd in Stitches and even Colin Baker commented that he felt like he was looking in a mirror! 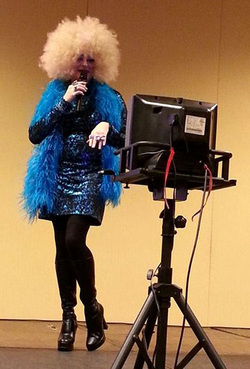 Moxie performed a song for the Cabaret and also did her own little bit of comedy for the con. Her favorite moment? Photobombing a group picture of all the Dr. Who costumers! Moxie's favorite event of the year is arguably the Matchgame at Outlantacon! 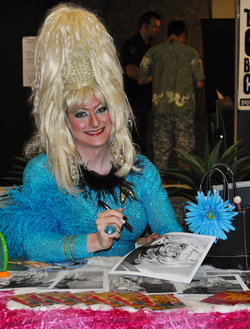 This year Moxie performed her comedy routine, hosted Flash Gordon, and appeared on the Matchgame panel. She also came to the "Naughty Bedtime Stories" in her PJ's! Moxie Returned to Trek Trax and was lucky enough to kick off the event with a MST3000 style presentation of a classic Star Trek episode. 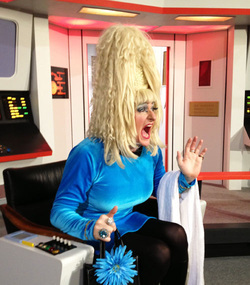 She spent the weekend promoting Towel Day in her position as 2013's Towel Day Ambassador! Moxie returned to the heartland this time for multiple duties. 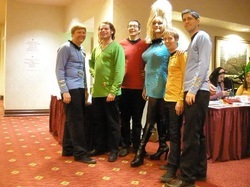 She again introduced the most fabulous Star Trek band in the universe, Five Year Mission. She was asked to MC the Orion Burlesque show and helped out by introducing several of the attending guests. She also got to see her BFF, Deborah Downey! 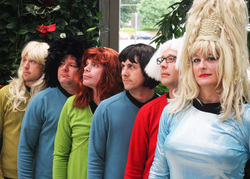 Miss Magnus sling shot back to the past yet again to open for her favorite band at Riverside, Iowa's Trek Fest, that annual celebration in the future birthplace and hometown of Captain James T. Kirk. 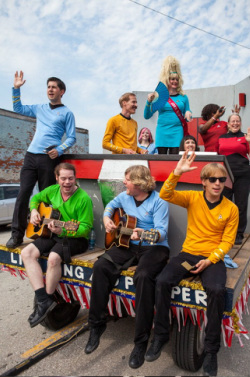 Moxie road in the captain's chair on the infamous "bridge float" of the Riverside Star Trek Fan Club. 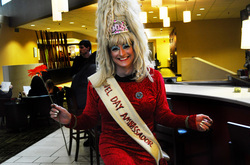 She wore a sash proclaiming her the "Iowa Gorn Queen" and kept her cool in the Iowa heat by shouting "Live Long and Perspire" to the throngs who'd gathered to glipse the only Star Trek Glamazon in captivity. She was surrounded by her retinue and her pals in that boy band FIVE YEAR MISSION: Those silver-tongued songbirds of prey who are recording a song for every episode of Star Trek TOS. Moxie had the time of her life at Timegate! 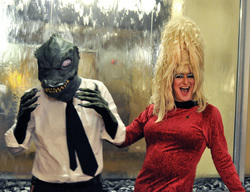 She got to co-host the Masquerade with that lovely Adam Siler! The highlight for her was amusing the capacity crowd at the cabaret with her rendition of Marlene Dietrich's "Falling in Love Again" in German, English and the original Klingon! Here you see her at her table (which was next to the lovely David Nykl of Stargate Atlantis). She's signing a picture of herself, signing a picture of herself, signing a picture of herself, and so on. Don't miss this con next year as it will be the 50th Anniversary of Dr. Who and they already have tons planned for your enjoyment (And Mz. Moxie will be back)! Moxie overshadowed the other celebrity guests (not figuratively, but literally--they were all much better at being witty than her but much shorter) in Outlantacon's version of Matchgame! 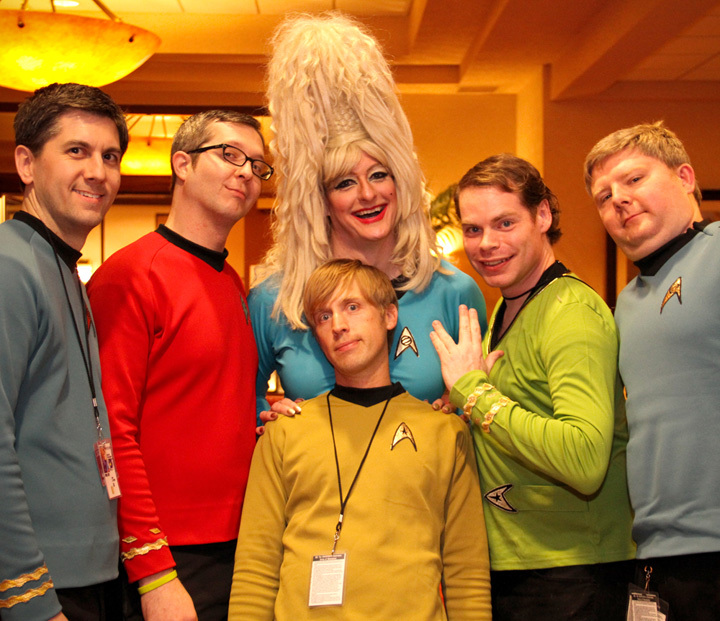 She was a judge on Nea's Drag Race and rejoined her old friend Andrew Greenberg on the Star Trek panel "The Final Frontier". 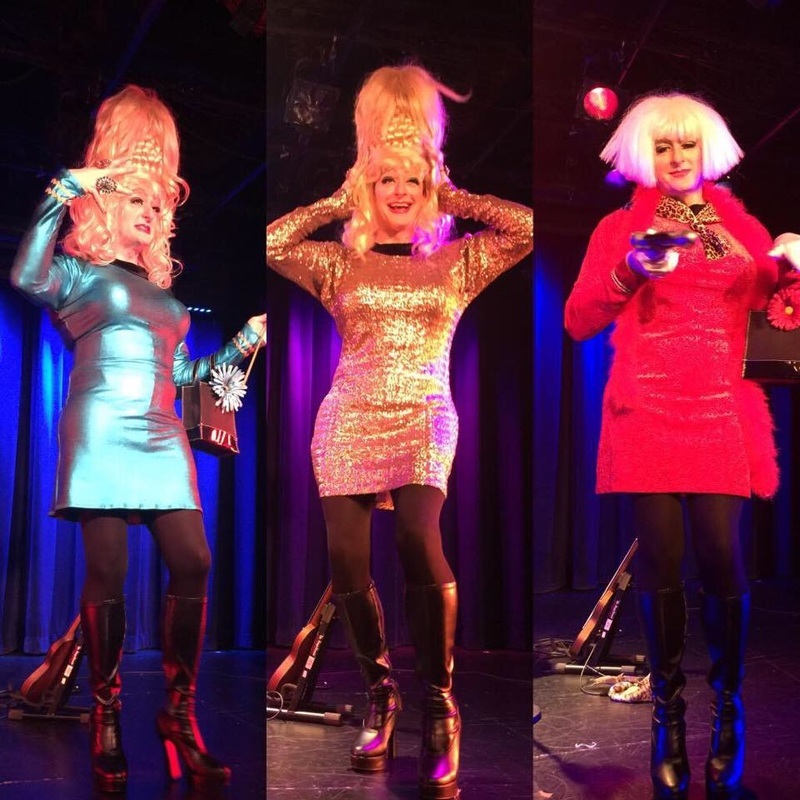 Best of all, Moxie performed 2 nights of high camp comedy before throngs of adoring fans. Moxie introduced the guys of Five Year Mission at the release of their second album Year Two. Moxie also met Deborah Downey (Mavig) and played cycletar for her. Her ears have recovered nicely.